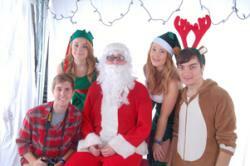 Customers could be photographed with Santa and his helpers at the Christmas MarketOnce again the Bangor University Student Christmas Market has attracted overwhelming support from customers across the university and beyond. A total of 150 students with 70 stalls between them offered a wide range of handmade products such as jewellery, arts & crafts, cards and decorations, knitted & crochet goods, cakes and chutneys, international foods, photography, pottery and Santa’s grotto. Over 1500 visitors who came through the doors during the afternoon had an opportunity to buy unique gifts with some of the profits going to charity. New this year was a pilot student market held in Bangor town centre on 4 December in collaboration with People of Bangor Community group who ran a week of festive celebrations in the city centre. Prior to the events, B-enterprising offered the stallholders a special one-off workshop by Helen Hodgkinson from the Mary Portas retail academy on ‘How to Sell your Product or Service’. Tips included thinking about improved engagement with customers and arrangement of merchandise. A prize was awarded this year for the best dressed stall judged against the criterion of effectiveness. Judges, John Jackson and Mari Roberts of the Bangor Employability Award (BEA) awarded the £100 voucher prize to Tinsel a Sbeis, (stall pictured here). Winners, Gwawr Thomas, Jen Lloyd, Beth Roberts and Linda Williams from the School of Education said of the event ‘it was a welcome break from assignments to be thinking about something different and festive, and the experience helped us to exercise our entrepreneurial skills – everything from pricing to the teamwork involved in thinking up a name …’ Judges; John Jackson and Mari Roberts (right) with winning stall holders, Tinsel a Sbeis. 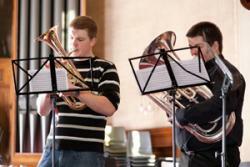 Festive live music and dancing was provided by student bands and individuals Tim Price, Tom Sayer, the University Brass Band and the Folk Music Society. Storm FM were also broadcasting live from the hall. 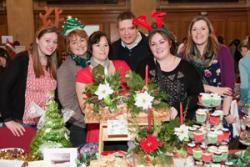 Bwyd@bangor once again supplied delicious hot festive food such as turkey & nut roast rolls, mince pies and mulled wine. The B-Enterprising team wish to thank everyone who contributed to making the event such a wonderful occasion for the University. Participating students earned 15 BEA xp for running a stall at the market. The event is currently funded from the Welsh Government through the Regional Hub partnership between Bangor University and Grwp Menai Llandrillo.